The best environmentally friendly natural cleaning products provide a chemical and toxic-free alternative to conventional cleaning solutions. Often formulated using natural ingredients, ethical practices, and using sustainable manufacturing, eco-friendly cleaning products are the perfect way to naturally clean every nook, cranny, room, and surface without causing damage to the environment – both inside and outside of your home. Check out the full list of featured natural cleaning products here. When it comes to cleaning your home, there’s no shortage of ways to get the job done, but finishing the task in a way which removes the use of harsh chemicals, toxic additives, and other equally unpleasant compounds can be a tougher problem to solve. Luckily, there are now more ways than ever to clean your house from loft to basement using products which are natural, utilizing environmentally friendly ingredients and manufacturing processes for an end-result which delivers the performance of conventional cleaners with all of the green credentials of an eco-conscious alternative. 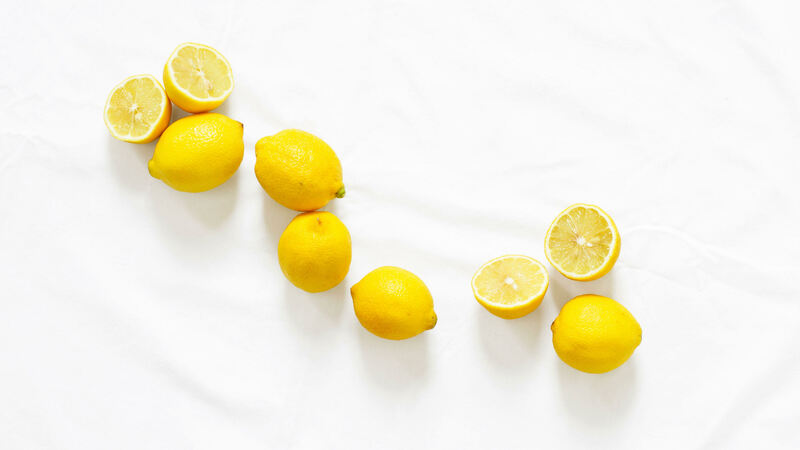 From washing the dishes, to taking care of surfaces, floors, and even washing clothing and bedding, the best natural cleaning products now cover pretty much the entire remit of home and domestic life, meaning there’s a green cleaning solution out there for the job. Whether you’re cleaning the kitchen or bathroom, dishes or floors, the best eco-friendly and natural cleaning products will help take the effort out of scrubbing, polishing, and cleansing, leaving you with a home which is naturally cleaner than it’s ever been. Whatever the room of the house, finding the best natural cleaning products for the task at hand means you’ll not only benefit from excellent results on grime, stains, and spills, but will also be using a non-toxic alternative to conventional cleaning liquids and solutions. We’ve rolled up our sleeves and taken a look at the very best natural cleaning products to help you make short work of every last tile, surface, and floor throughout your home. The kitchen is one of those spaces in the home where we spend a lot of time and energy in our everyday lives. What this eventually means of course, is a lot of cleaning on a regular basis. Whether it’s cleaning dishes and pans or scrubbing surfaces and appliances, the kitchen represents an area with a whole load of requirements when it comes to cleaning objectives and of course, suitable cleaning products for getting the job done. This doesn’t mean that you have to settle for a cleaning cupboard full of chemical-based, toxic cleaning liquids however, and finding the best natural cleaning products for the kitchen is now easier than ever thanks to some awesome brands looking to bring sustainable ingredients and ethical practices to the front when it comes to achieving a sparkling countertop and gleaming dishes. This natural dishwasher detergent powder from Grab Green utilizes a non-toxic formula and is free from phosphates, chlorine, and dyes, meaning you don’t need to worry about the effects of using at home on a regular basis. 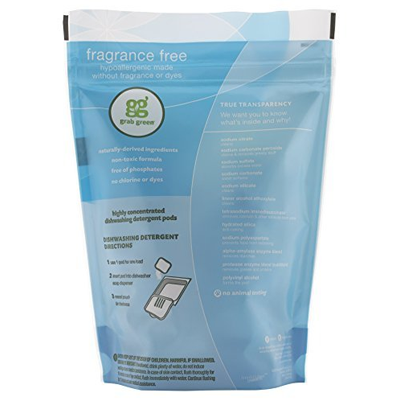 A fragrance free formulation makes this natural dishwasher detergent powder hypoallergenic and safe, with each pack providing enough powder for 80 loads of dishes. The naturally-derived ingredients in the Grab Green dishwasher powder mean that it’s non-toxic and able to provide a superior clean without the use of harsh chemicals or known carcinogens. Among the ethical policies of the brand, Grab Green use as few materials as possible in their products while ensuring that no phthalates, solvents, ammonia, phosphates, fillers, optical brighteners, masking agents or dyes are used in production. Oh, and they never test their formulas on animals, so if you’re looking for the a natural dishwasher detergent with a conscience, then Grab Green have got you covered. Method have built a reputation in the industry as one of the most trusted brands when it comes to ethical and environmentally conscious natural cleaning products. 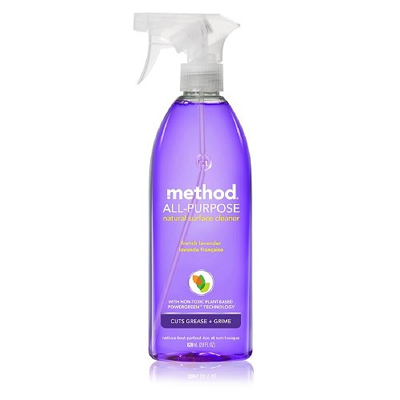 The Method All-Purpose Cleaner is a green surface cleaner spray bottle that’s naturally derived and free from phosphates and parabens. Utilizing what Method calls ‘Powergreen’ technology, this natural all purpose cleaner uses non-toxic ingredients to deliver a high performance cleaner that’s hypoallergenic and effective on most non-porous surfaces such as counters, glass, tile, stone, and wood. The green credentials of Method start with the brand itself which is a founding certified B Corporation, meaning the organization champions ethical practices relating to manufacturing, local communities, and the wider environment. As well as being formulated from biodegradable ingredients, the Method All-Purpose Cleaner comes in an easy application, 100% recycled plastic spray bottle, allowing you to grab, spray, and wipe away with ease. 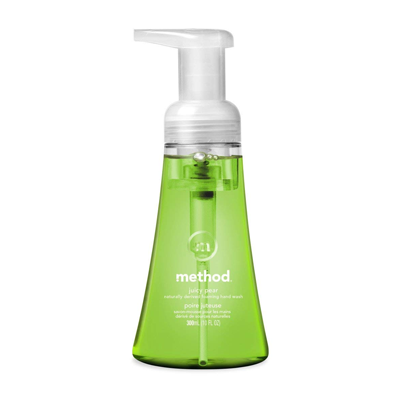 The dish washing soap from Method is made from natural ingredients and comes in a pump bottle for easy dispensing. Utilizing what Method call Powergreen Technology, this eco dish soap is biodegradable, non-toxic, and free from Triclosan. As with other products in the Method range, this dish soap is naturally derived from non-toxic ingredients and is certified cruelty free, testing only on humans and never on animals. When it comes to sustainability and corporate ethics, Method are a founding B Corp certified member company and all of their bottles are made from recycled plastic, with the company priding itself as a leader in ethical and environmental practices. 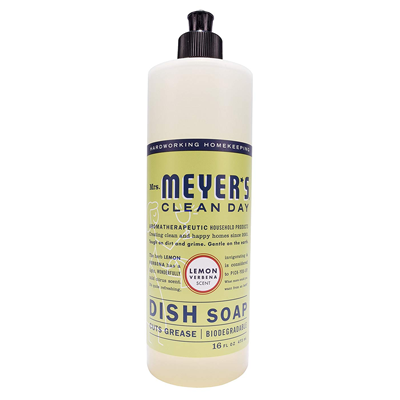 The top natural dish soaps provide the ability to buy refills that allow you to top-up the bottle once you’re out and the Method Dish Soap is no different, offering a cost-effective and low footprint 36 ounce refill so you don’t run dry when you get to the last drop. Finding the best green cleaning products is about more than simply finding those without a long list of harsh ingredients, and Method’s Dish Soap is a great example of a brand that covers these essential areas while maintaining a focus on ethical practices right back to the company level. 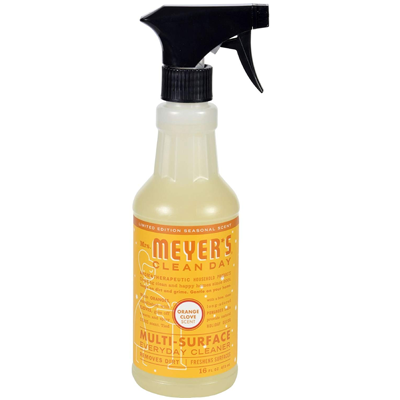 The Clean Day Multi-Surface Everyday Cleaner is a naturally formulated countertop and surface cleaner in an easy application spray bottle. A safe and effective formula that’s 98% naturally derived from biodegradable ingredients, this green kitchen counter cleaner is just as at home on any non-porous surface whether you’re using in the kitchen, bathroom, or any rooms and surfaces in between. Effective on almost any hard household surfaces, this natural surface cleaner can be used in the kitchen across tiles, laminate countertops, sinks, and faucets, as well as elsewhere throughout the home on linoleum and finished wood floors, bathroom fixtures, and tubs. Made with essential oils and plant-derived ingredients, the Clean Day Multi-Surface Everyday Cleaner doesn’t contain any animal-derived ingredients and is not tested on animals, making it one of the best natural cleaning products for use in the kitchen if you’re looking for an animal friendly eco-surface cleaner. Similarly, if you’re after a natural kitchen cleaner that will tackle all of the surfaces as well as your appliances and even the kitchen sink, then the Clean Day Multi-Surface Everyday Cleaner is one of the best ethical options on the market when it comes to high performance results without the heavy environmental footprint. This eco-friendly dish soap from Puracy promises superior cleaning power with the capacity to wash over 150 loads of dishes per bottle. 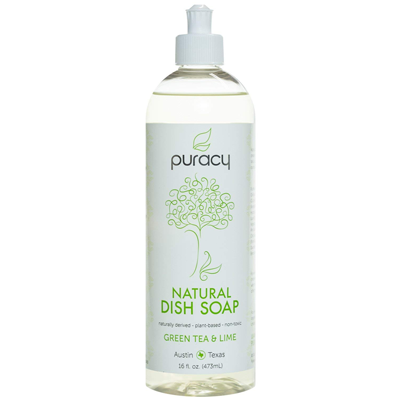 Puracy are unique in that their Natural Liquid Dish Soap is the only one on the market with zero sulfates. Formulated using advanced plant-based ingredients, this green dish soap does its thing without SLS and is designed to be both non-drying and non-irritating to skin meaning you can use it without gloves. The best natural dish soaps will remove the need for harsh chemicals at every opportunity and in this regard, Puracy deliver on this ideal with no sulfates (such as SLS, SCS, SLES), parabens, petrochemicals, parabens, toxins, caustic ingredients, or perfumes. On top of this, the Puracy Natural Liquid Dish Soap is hypoallergenic, gluten-free and biodegradable, as well as being vegan – no animal testing, no animal by-products in the ingredients, and certified cruelty free. If you’re looking for one of the best natural dish soaps for a green kitchen, you’ll be hard pressed to find a solution more comprehensive than this one. This environmentally friendly dishwasher detergent gel from Seventh Generation is one of the best natural cleaning products on the market if you’re looking for an eco-friendly alternative to taking care of the dishes. Formulated using plant-based enzyme blends to remove grease and leave dishes streak-free and sparkling clean without resorting to the use of chemicals, this natural natural detergent is made with plant-based ingredients and is free from fragrances, phosphates, chlorine, dyes, NTA or EDTA. The enzymes utilized in the Seventh Generation detergent work by breaking down starch and protein-based residues on your dishes from food, while surfactants remove grease and stains by holding the molecules in suspension so they can be washed away. 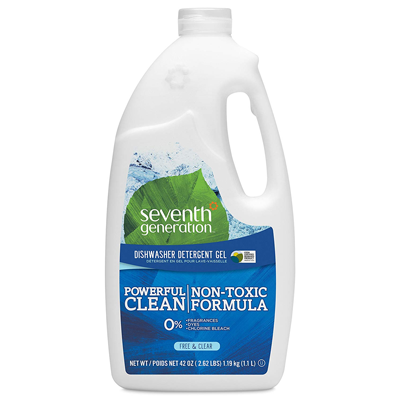 The Seventh Generation Free and Clear Dishwasher Detergent Gel is a USDA certified 65% Biobased product and as with the best natural and green dishwasher detergents, is non-toxic, biodegradable, and hasn’t been tested on animals. Seventh Generation are a Certified B Corporation, meaning the brand is certified to be employing policies which are better for workers, communities, and the environment. After the kitchen, the bathroom is probably the next most frequently cleaned room in the house. Whether it’s the bathtub, shower, toilet, or sink and faucets, the fixtures and fittings in the bathroom are just the start when it comes to keeping things squeaky clean. Tiles, floors, and shower doors are equally prone to continual cleaning in the bathroom and whether we’re talking about the regular maintenance clean, or the monthly deep clean, getting the job done properly usually requires a good number of high performance products. 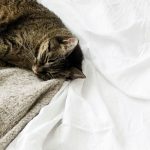 In this section of the guide, we’ve taken a look at the very best natural and eco friendly bathroom cleaners that steer clear of many of the conventional products, avoiding harsh chemicals, toxic substances, and dangerous bleach based cleaners in favor of safer, greener, and ultimately, cleaner alternatives for this vital room in your home. This heavy duty natural bathtub cleaner brings together a long list of eco-friendly properties as well as an equally impressive set of high performance cleaning credentials. Utilizing a combination of micro-abrasives and powerful cleansing agents this green cleaner is the ideal solution for getting to work on tubs, tiles, and toilet bowls, while also being versatile enough to make short work of kitchen areas too – think: stove tops, glass cooking tops, ovens, stainless steel sinks, and even pots and pans. The best natural cleaning products for any room in the home need to be free from harmful and toxic additives. 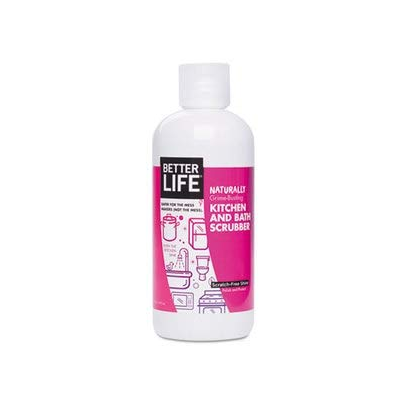 With this in mind, the Better Life Natural Kitchen and Bath Scrubber is free from VOCs, petroleum, and alkyphenol surfactants, as well sodium lauryl/laureth sulfates, ethoxylates, synthetic fragrances, bleach, dyes, parabens, ethers, and alcohol Add to this impressively non-toxic list, the fact that this cleaner is also not tested on animals and is packaged using recycled, biodegradable materials, and you’ve quickly got one of the most flexible and ethical cleaning products on the market. 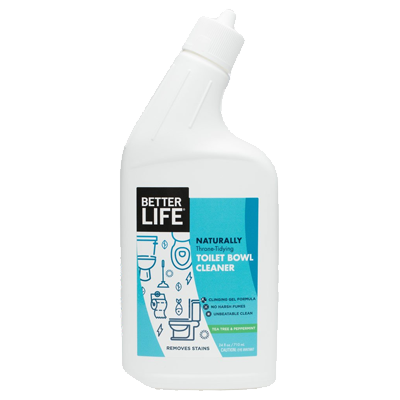 The Better Life Natural Toilet Bowl Cleaner is formulated using natural plant-based ingredients to deliver a high performance and low effort cleaning result. Safe for both septic tanks and for waterways, the Better Life Natural Toilet Bowl Cleaner is free from bleach, chlorine, synthetic fragrances, dyes, petroleum solvents, and phosphates. As with many of the best natural cleaning products for the bathroom, Better Life’s products demonstrate a ton of green and ethical credentials that go beyond removing harmful active ingredients. From packaging produced using solar energy and recyclable materials, to formulas that break down in the environment and which are never tested on animals, these products mean you’ll be able to use cleaning products with a conscience for a truly greener clean. Consider this if you’re looking for a natural toilet cleaner that gets the job done quickly and effectively without relying on harmful chemical ingredients. Same results, but better for you, your home, and the environment. 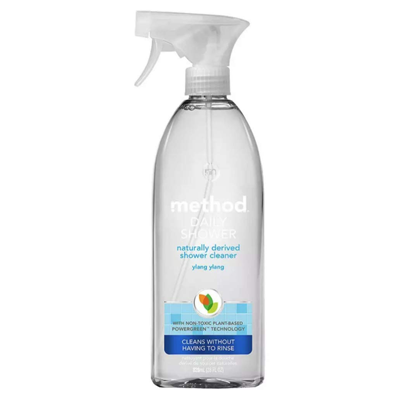 The Daily Shower Spray Cleaner from Method utilizes naturally derived, non-toxic ingredients to break down dirt and grime in the shower without resorting to unpleasant chemicals. Simply spraying after every shower is all that’s needed to get going, at which point the unique formula of lactic acid and corn-starch-derived decyl glucoside will get to work dissolving mildew and preventing soap scum and lime deposits from building up. The end result? A shower that looks and smells even fresher and cleaner than you do. Method are a leader in the green cleaning product movement and have a track record of producing some of the very best eco friendly cleaning products for the bathroom. As with other cleaning products in the company’s range, the ingredients of the Daily Shower Spray Cleaner are biodegradable and are formulated to break down whereby at least 70% of organic ingredients will have broken down within 28 days. As well as being a Public Benefit Corporation (PBC), Method adhere to a whole lot of green standards and certifications, utilizing 100% recycled plastic in almost all of their packaging, and never testing any of their products on animals (the brand is CCIC Leaping Bunny Program approved). Why we love it | Effective, natural, and cruelty-free. What’s not to like? 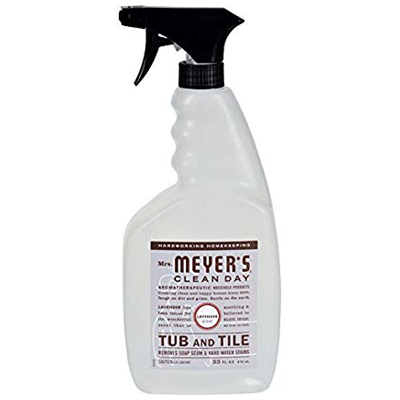 The Tub & Tile Cleaner from green cleaning brand Mrs. Meyer’s is super straight easy to use – simply spray and wipe clean. Highly effective at cleaning bathtubs, surrounding areas, and tiles, this natural tub cleaner is formulated to deliver the same high quality results on everything from porcelain and countertops, to sinks, shower doors, and toilet seats. Green credentials don’t detract from the effectiveness of this eco bathtub and tile cleaner however, with the product able to remove 4x more soap scum than leading natural brands. Made from naturally derived ingredients, this bathroom cleaning product is dye-free, paraben and phthalate free, and is formulated to be biodegradable. A cruelty-free philosophy is also top of the agenda with this product (and other in the Mrs. Meyer’s range) and the Tub & Tile cleaner is made from plant-based ingredients and is not tested on animals. From natural contents to recyclable bottle, if you’re looking for a bathtub and tile cleaner with significant green-credentials and the power to remove dirt while adding protects against mold and mildew, then this environmentally friendly cleaner is what you’ve been searching for.